Beth has experience teaching all ages and levels of riders, from children to adults and beginner to advanced. Beth’s teaching philosophy centers on the use of positive, confidence building instruction to build solid fundamentals, both in and out of the saddle. Beth’s instruction emphasizes correct flatwork and safe jumping to produce confident, successful horse and rider partnerships. One of her strengths is her insight into what will work best for each horse and rider, and her skills at communicating these ideas to her students. Beth teaches not only the “how” of riding, but the “why” as well. Beth’s students range from young children in their first year of riding to successful Preliminary/Intermediate level eventing partnerships. 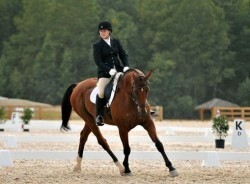 Beth is also active in the United States Pony Club (USPC). Her students have won many ribbons, including USDF and USEA area and national awards. They routinely compete in area championships and at the AEC’s. Most importantly, Beth’s students are confident in their riding and horsemanship abilities and enjoy the partnerships they have with their horses.